Agilent Technologies Inc. (NYSE: A) announced the Agilent U2942A Parametric Measurement Manager Pro, software designed for basic yet complete DC parametric testing on component devices. The software works with Agilent U2722A and U2723A USB modular source measure units to analyze discrete semiconductor devices, without the need for prior programming experience. The software's intuitive user interface simplifies configuration and testing, allowing users to focus on data analysis. It also gives them the ability to define and customize test profiles and includes built-in math functions to reduce testing time. The software, known as PMM Pro for short, can be used in many applications and industries, including education, manufacturing and semiconductor testing. 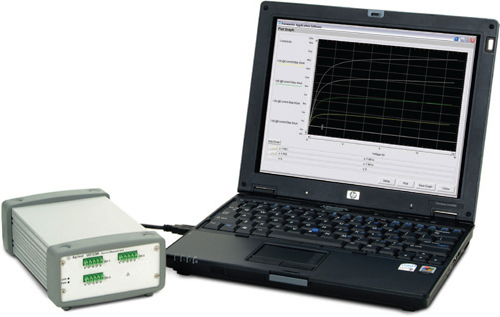 Combined with an Agilent U2722A or U2723A USB source measure unit, PMM Pro software provides high measurement sensitivity of 100 pA and four-quadrant operation on a three-channel unit. 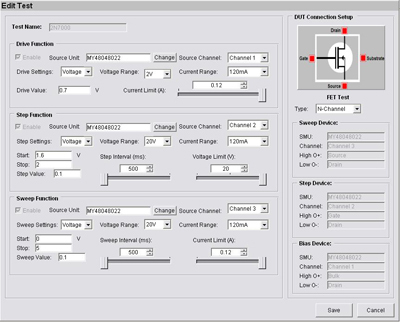 PMM Pro also gives users the ability to make parametric measurements quickly and efficiently with automated test sequencing and predefined test profiles for diode, bipolar junction transistors and field-effect transistors. After taking the required parametric measurement, the software plots, displays and logs the results in an IV curve. "Agilent's Parametric Measurement Manager Pro software enhances the parametric measurement capabilities of our USB source measure units, offering customers a basic yet complete IV-curve tracer solution," said Ee Huei Sin, vice president, Agilent's Basic Instruments Division. "This setup is one of the most cost-effective solutions available today for diode and transistor performance analysis." AgilentU2942A Parametric Measurement Manager Pro software is available for only $300. The U2722A USB source measure unit is $2,213, and the U2723A USB source measure unit, which includes embedded test scripts, is $3,609. Agilent's U2722P Parametric Measurement Solution bundle includes the U2942A Parametric Measurement Manager Pro software and a U2722A USB modular source unit for $2,313. Agilent's U2723P Parametric Measurement Solution bundle includes the U2942A Parametric Measurement Manager Pro software and a U2723A USB modular source unit for $3,709. Bundles are available in Europe and Asia (excluding Japan).